Damian Boggio was playing a tanda of Hugo Diaz which I was sitting out when a local teacher (who runs a small milonga and does the DJing there) comes up to me and complains that she find this nuevo stuff boring. I pointed out that this was Hugo Diaz and she managed to remember he’s the one who plays the harmonica (quite obvious from what was being played). I said I think Hugo Diaz is folk as opposed to nuevo. She didn’t quite agree so I googled it this morning but don’t see many Nuevo links to Hugo Diaz. The same teacher later taps me behind the back and asks if I knew how to dance and wanted me to dance the tanda with her. After about three songs, she wondered who the orchestra was. Well, assuming Damian didn’t just play Francisco Canaro’s Poema and then switch orchestras, I would say that it was a Canaro tanda. What can I say? If you’re a teacher please please please study the music, especially if you DJ for your own milonga. Thank God she didn’t try to sell me stuff this week. In most classes, the last 20 or so minutes is usually dancing the concept/pattern/sequence taught in the class over and over again. The teacher goes around helping and partners rotate at the end of each song. Two variations are common, the followers move to the next leader in the ronda or the leader moves to the next follower in the ronda. But what Sebastian Misse did in a recent workshop was sit the women down on one side of the room while the men stood on the other side. Then the men had to cabeceo the women for the next dance. Its probably a little time consuming to wait until all the women down before playing the next song but I think its brilliant. More teachers should follow, its something that requires practise and is a vital skill for students. I’ve always struggled with the music, like a lot of other dancers I know, I grew up not having much music education besides what I did for a couple of terms in secondary school. So when I started tango, not only did I struggle to move in time with the music, I struggled to even know how to find the beat. I was so used to modern pop music and tango had so many more layers to it. Teachers taught me figures and sequences, but never explained the music. Occasionally there were “musicality” workshops where the teachers talked briefly about the music and taught sequences they thought fit the music. I was lucky enough to have attended Joaquin’s classes in Carablanca and also purchase his book Lets Dance to the Music which can be ordered from his website. The book comes with a DVD with examples for each chapter. It starts bottom up, with finding the beat, double time, half time and moves onto more advanced (for me) topics such as question and answers and the form of tango songs. Another book I found useful is Aaron Copland’s What to Listen for in Music. Its not about tango, but its about music and written for the laymen like me. Unfortunately, there are no musical examples on a CD so I had to find the examples on youtube. There are many other resources out there and I’m more than happy for someone to give me suggestions. I haven’t stopped dancing, its just that I changed companies and WordPress is blocked at work and I’m usually too tired/busy after work to write new entries … I’ve been dancing less lately, partly due to other things happening in life and partly due to not really having a great time in milongas. One thing that really kills it for me is when I’m trying to cabeceo a lady for a dance, some sod comes up and sticks their hands out to invite the woman, and the woman accepts. So if I’m in an environment where walking up to invite is so common, what do I do? Javier was talking about codigos recently and I was lucky enough to attend his very popular classes. He promotes the cabeceo without any reservations and he talking about various strategies to use and educate it. Disclaimer: what I present below is what I made out from his broken English (which is getting a lot better) and also the interpreter’s broken English. Javier may have been tying to make an entirely different point but these are what I think he was saying. Firstly, never walk up to a woman and invite her to dance. If she’s not someone who uses the cabeceo much (or at all), you can walk up to her, chat but do not invite her to dance. Instead, ask if she wants to dance to XYZ orchestra later when it comes on. (Of course, if that orchestra doesn’t come on then this may not work). But the idea is to suggest to her to look for you at a later time in the evening. And for the women, saying no is nasty. Its not nice to say it and its even worse to receive it. When a particular poor dancer or beginner who does not know the cabeceo walks up to invite, there are ways to reject them and not make them feel so bad. The suggestion first involved saying yes – you will help them by going to classes with them (if you want) or practising with them so that they get better. But no, you will not dance with them at this particular time because you want to dance with XYZ over there who instead. I have read that no is no and women don’t ever need to explain why, but I’ve been on the receiving end of many rejections and its never nice. If you’re in a particularly quiet milonga, it can get a little awkward as well and I do think Javier’s suggestions of saying yes to say no is nice. Tango Siempre performed one set this year at the Royal Festival Hall from 6pm to 7pm on the 28th December 2010. A lot of dancers turned up for the live music but we all agreed it was too short. 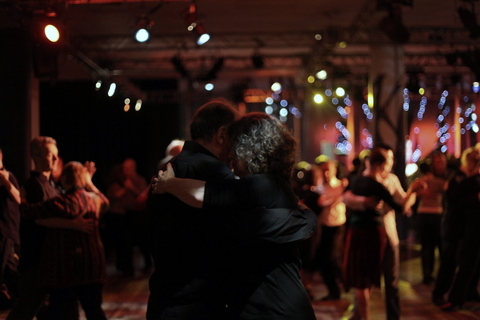 Last year, Jenny Surelia was involved and also gave a performance and it was a whole afternoon of very good tango. They played a good number of very danceable tracks, I personally don’t like dancing to live music as music as recorded golden age tracks but Tango Siempre are one of the groups that play danceable music. A lot of people turned up for the event, not only dancers but the general public and it was clear that everyone enjoyed it. Lets hope that next year there’ll be another set and whole afternoon of fun again. Carlos and Rosa Perez are back in London. Last year Carlos had some difficulty getting up the stairs in Negracha but no difficulty in giving this performance. Most musicality classes I go to are about clapping and stepping to the beat, then maybe stepping in double time and also stepping in half time. Even classes that were labelled as dancing to Di Sarli or D’Arienzo are like this. After those classes, I have no greater understanding of Di Sarli or D’Arienzo, afterall, there are moments where stepping in half or double time makes sense in most songs of both orchestras. Adrian and Amanda’s musicality classes are different. They first introduce the double bass which plays the most obvious beat to dance to. But then the other instruments in a tango orchestra aren’t there to look pretty, they can be there to dance to as well. There are other instruments such as the violin, piano, bandoneón and the singer all contribute to the music. 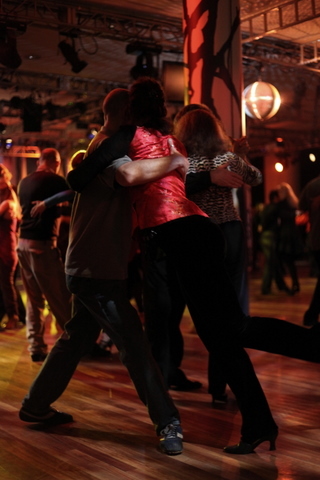 There are layers to tango music. They all contribute to a different feeling inside you and you can choose how you wish to express the music when you dance. Adrian and Amanda’s musicality classes are the best I’ve been to. 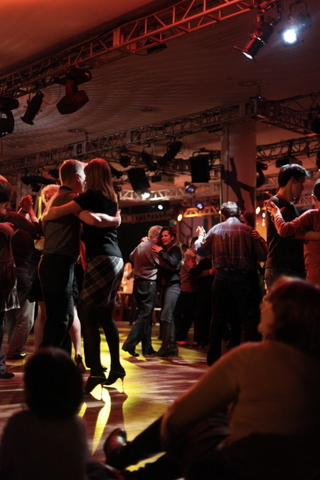 There is no dancing, just sitting down and discussing the various possibilities about tango music. What to listen for various ways that music can be interpreted. If you’ve not been before watch out for them again next year on Brigitte’s website. Its a shame noone in London teaches just the music.